As devastating as a two car accident can be, nothing compares to a vehicle and its occupants being struck by a semi tractor-trailer. Over 2,800 people have been injured in large vehicle (truck/bus) accidents. There were over 11,000 heavy vehicle crashes in that year. Even pedestrians are not immune as victims of heavy vehicle accidents. In the year 2013, 42 pedestrians were involved in these types of accidents. Approximately seven suffered death, and the rest were injured. Over 3,000 people died in large vehicle crashed nationally, 67% were occupants of cars and passenger vehicles. 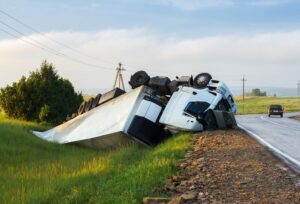 Truck accidents can be quite complicated insofar as the advertising banners on trucks may not reveal who the actual owners of these vehicles are. In other words, the driver of the truck may not actually be the owner of that vehicle. Truck drivers usually work for larger companies, who can be held liable for their driver’s negligence. In addition, many truck drivers lease their trucks to large shipping companies, making the lessee liable for driver negligence. Finally, the trailer that is pulled by these gigantic vehicles is sometimes owned by another company altogether. It can be a complicated process to discover just who is responsible for injuries suffered by persons in truck accidents. Wigod & Falzon can help clear the way to finding out exactly who is responsible, and recover maximum dollars for those injured by heavy vehicles. In addition to ownership issues, state and federal regulators are constantly creating and amending rules that trucking companies and their drivers must follow in regards to the delivery of goods and merchandise across the United States and specifically in the State of Michigan. Breeching these rules can subject the public to harm, and therefore truck drivers are monitored in regards to how fast they go, and how many hours on the road they are allotted per twenty-four hour period. Breaking these rules can be evidence of negligence on their part. Internal computer programs and GPS satellite tracking are now state of the art in the trucking industry. Obtaining these records is vital in proving ones case. The Michigan truck accident lawyers of Wigod & Falzon can help you gather the evidence necessary to obtain maximum recovery for the injuries you suffer, or the death suffered by loved ones. Call today for a free consultation if you or a family member is the victim of a heavy vehicle accident. Remember, you pay us nothing if we do not recover for you!